When most people are watching fireworks in July, I’m stacking hay to last me through January. And when most of you are sighing in relief at the first break in the heat in early September, I’m beginning to wonder how long I have until the ice comes and the water spigot in the horse barn freezes. Weirdly though? I don’t hate winter, even with all of it’s extra work and required logistics. This year, the winter season came late and quiet. 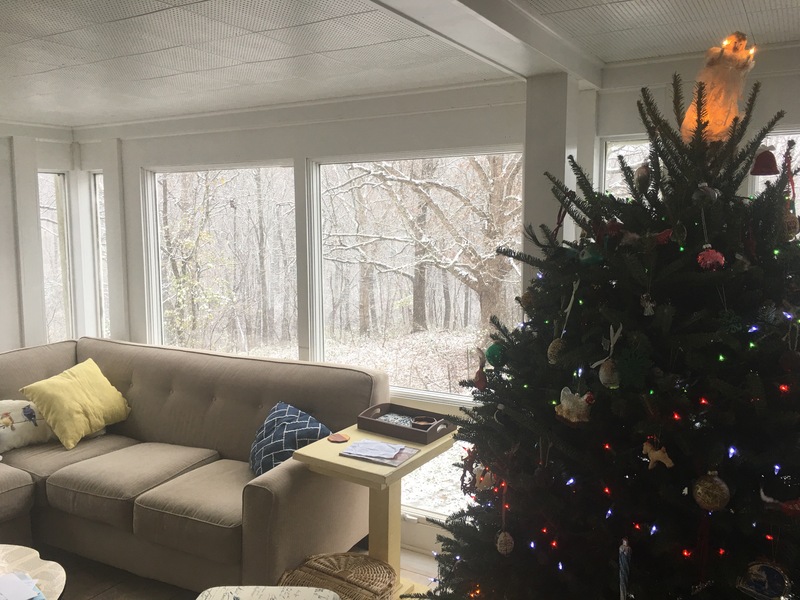 While my love for the winter season isn’t usually long-lived, I will admit to a predictable infatuation that comes briefly every year when snow first starts to blanket the ground. Earlier this week, while the snow fell, I fell enamored. It’s so many little things this time of year. Maybe it’s the ugliness of the gray brown mud being covered up with something so lovely and unblemished as the snow. The birds, so hard to spot against the lush green backdrop of the woods in summer suddenly stark and visible against a white, winter canvas. My dad came to help me with morning chores while it snowed. Regular maintenance met seasonal necessity, and we worked for an hour and a half to get the ranch ready for the day and ready for the season. Water heaters were set up. Heat lamps plugged in. Round bales set out. Then, with all of the creatures comfortably tucked in, I did the strangest thing. I went into the house, took a hot shower, put pajamas back on, and sat on my couch for the rest of the afternoon watching the snow fall, reading a book, and cuddling with a cat. Only after an entire afternoon of blissful nonaccomplishment did I wander out in the dusk to start evening chores. There is something so complete about the quietness that comes hand in hand with the first snow. During all of our other seasons even the quiet comes with a subtle cacophony of nature: owls, crickets, frogs, all of them singing their songs as I go about my business. But in the winter, the quiet takes on an austerity. It’s the sort of quiet that feels holy: an invitation to notice what stillness feels like, or maybe just an invitation to notice. 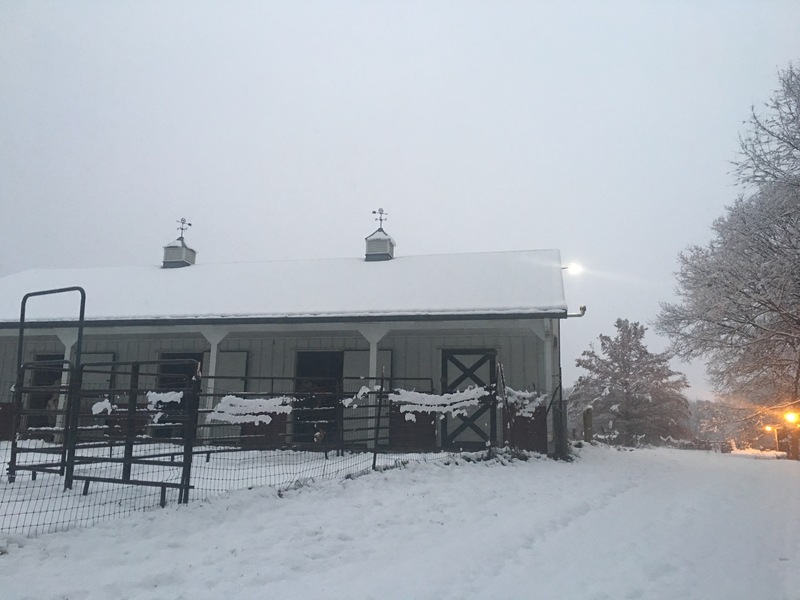 The only sound was the crunch of my own footsteps as I walked to the barn, so I stopped walking. The woods were perfectly still. The world looked like a painting in black and white; the harsh edges softened. The muck temporarily erased. The quiet was complete, and for a moment, winter felt utterly magical. Merry Christmas, Everyone. May it feel utterly magical. Next Writing the truth: on Divorce. Beautiful writing, beautiful sentiments. Thank you for creating and posting this. So happy to be reading your words again. Merry Christmas to you! Enjoy your pretty-as-a-postcard view. What a lovely post, Cherity. Merry Christmas to you… keep warm and toasty! Thank you. I really love reading your vignettes of life. Merry Christmas to you and ALL your family, both two legged and four legged. Thank you for reading; I’m glad you enjoy these little blips. Merry Christmas right back at you.